The Ragged School is one of the oldest buildings in the Dog Kennel area. It is important as one of the few surviving buildings from the Dog Kennels area and the remains of Wheeldon Lane, the western boundary of the Dog Kennels can be seen running down the side of the Ragged School – this road ran up to Low Pavement opposite the Market Hall. Ragged School in 1911, the year before the Dog Kennels was demolished. The school building is on the left, the buildings centre and right were demolished in 1912 when Markham Road was built. Originally a factory, the development of the Ragged School is detailed by David Botham, below. Some background on the Ragged School from David Botham. 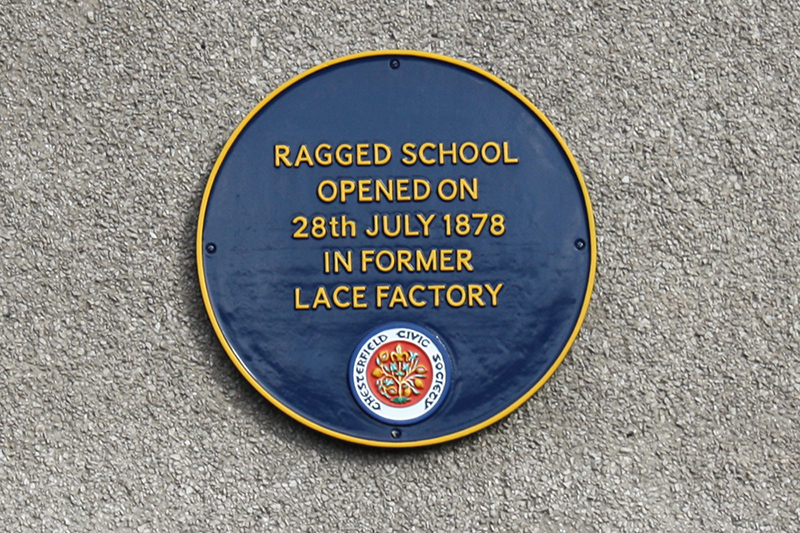 “Yes, but why is it called the Ragged School ?” they ask. To understand this one needs to know a little about the industrial towns of Victorian England. Factories grew unplanned and uncontrolled wherever the enterprising industrialist could find essentials such as a source of water power or reasonable communications. Such places attracted a labour force of poor folk, sometimes displaced from their place of birth by the harsh realities of 19th Century life. Without work you starved. During the Irish potato famine people starved anyway, some migrant workers came to the industrial towns to find a living. Often it was a hard living since they rarely got help in finding food or shelter. Model villages like Bournville or Saltaire were the exception . Most new arrivals had to begin by renting lodgings in the roughest part of town. Some never got beyond that, even if they acquired a family. Their offspring ran about the alleyways, barefooted scavengers in ragged clothes, uneducated and often uncared for. Desperate for food, they would take menial jobs for long hours in appalling conditions from as young as ten or eleven years old. In the mid-nineteenth century, Lord Shaftsbury was a key figure in drawing attention to the plight of such children. He encouraged the establishment of free Sunday schools in the poorest quarters of large towns and cities to teach the scriptures and impart some elementary Christian education. These were run by volunteers and often took on a wider role, acting as a welfare centre too. At one time there were over a hundred such schools in England. In 1878 one of the last to be established was opened in Chesterfield. They were called Ragged Schools simply because they were for ragged children. At this point the more persistent enquirers usually pose a couple of further questions. The first observation is accurate. The main building was never intended to look like a church for the simple reason that it began life as a factory. The chapel records indicate several different owners, using the premises for a variety of purposes which will be described later. As for the houses, I am reminded of the question asked by a visitor to Hardwick Hall. When the Ragged School opened there was no traffic thundering by. There was no Markham Road, New Beetwell Street, bus stand or car park. The townscape consisted of a rabbit warren of narrow alleyways running south from the market place right down to the banks of the river Hipper. In 1878 these long yards were tightly packed with all kinds of industry interspersed with rows of terraced workers cottages. The reason for this pattern of development is a fascinating story which is well worth a brief digression before we return to the school itself. Chesterfield stands on a crossroad. 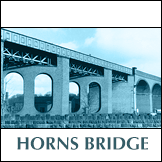 Trade routes linking Chester and the west coast with Lincoln and the east meet the Rother valley running north followed by the old road from Derby to Sheffield and Leeds. This junction has been of significance since Roman times and sustained a market town long before its first Royal charter, granted by King John in 1203. On the south side of the market place ancient medieval burgage plots of unusual length set a pattern of land ownership that survived right into the twentieth century. An indication of the plot widths can still be seen in the Low Pavement frontages with their mixture of former houses, shops and coaching inns. Archways gave access to outbuildings and smallholdings at the rear. On Glossop’s map of 1827, these are still mostly indicated as gardens and orchards. Stables, workshops and small cottages cluster around alleyways from the Market Place. Some factories are already evident along the river. 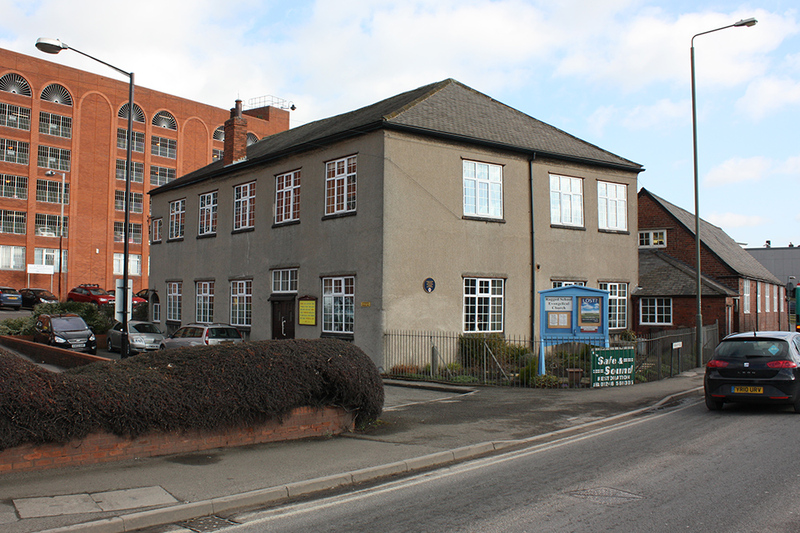 By 1837, a square block has been added at the end of Wheeldon Lane, which matches the size and location of the present main two storey building. According to the deeds, this was used as a carpet factory, tobacco and pipe factory and warehousing. It may also have been a lace mill. 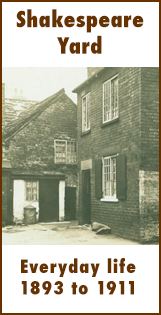 Just before the mission opened, it was in use as the Waggon beerhouse with common lodgings on the first floor. By the 1870s, many of the long yards had been developed to provide cheap terraced housing alongside a variety of mills, foundries and other commercial enterprises. The area began to acquire a doubtful reputation. Before long, policemen were instructed not to venture alone into the alleys. A resourceful superintendent once swore in a large group of roughs from the area as special constables and kept them cooped up in the market hall all day in expectation of a riot only they could have started! Life certainly dealt you a mean hand if you had the misfortune to be born in such a place. Four young men in the Sunday School Union were deeply moved by the plight of the children and felt called to start a mission. In 1876 they began distributing tracts. Cottage meetings were held for a while but had to be abandoned because of an outbreak of fever. Seeking premises to establish a permanent work, they found the former factory on Wheeldon Lane vacant. Its previous tenants had run such a bawdy beer and lodginghouse that the authorities had closed it down. The position was easily reached on foot. From the market an archway (by Joplins) led to Wheeldon Lane. Although no wider than a cart track, this led to a ford across the river and was a busy thoroughfare. From east to west there were no roads of any kind but a narrow ‘ginnel’ linking the long yards emerged from a gloomy passage under the old factory at this point. Traces of the archway and bracket for the gas mantle can still be seen. The name of the ginnel was also the name of the area. Dog Kennels was the name on the blue enamelled sign that still rusted on the wall sixty years after the alley closed. 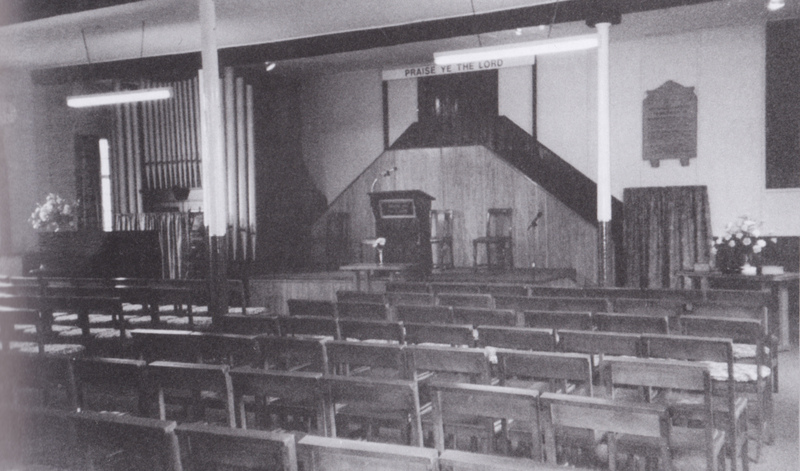 The mission team duly rented the upper room and opened for the first time on Sunday, 28th July, 1878. One hundred and nine children came that morning. The four teachers enlisted more help. After two weeks, an afternoon meeting was added. After three weeks, an evening gospel service was held, attended by fifty adults. The mission continued to grow. A teachers meeting was inaugurated to govern the school. Minutes of the first meeting are dated 30th October, 1878. On May 5th, 1879, the Ragged School became a member of the Chesterfield Sunday School Union. Public support for the work, especially from other churches, was generous. Denominational differences were put aside as donations of books, food and other gifts were sent. The founders seem to have resolved from the very first that they would devote all available resources to the local work and waste nothing on formal ties with Methodist, Baptist, Congregational or other organisations but rather welcome them all as friends and fellow workers. This remains true today. The effectiveness of such wholehearted concentration on the job in hand is reflected in the attendance records. By 1885 there were 340 scholars and 27 teachers on the books. More impressive still was the proportion of these who were coming regularly. Average weekly attendances were 319 and 24 respectively. Discipline must have been very difficult, to maintain. The school rules are most illuminating. The requirement that” Teachers shall not hesitate to move from their accustomed places to quell a disturbance..” (rule 7) rather suggests that quelling was frequently needed! Mid-week meetings and social events were soon added to the school’s calendar. Band of Hope, Sisterhood, Christian Endeavour, classes of various kinds, Christmas treats, summer trips and games, special mission weeks all gave interest, direction and purpose to the lives of those involved. When it became evident that many of the children were poorly fed and rarely had anything for breakfast, the teachers organised a basic meal before Sunday school. It is not known how many years they were able to continue this kind of help, but it certainly made the place even more popular! Finally an interior photo, date unknown. Glad you like it Wendy – thanks for posting. My father myself, my brother and sisters were ‘Christened in The Ragged School. Two of my older sisters were also married there. I remember Mr C Tingy was the Minister. My mum and her sister and brother attended raggerd school in the 1920s , I love this site and delving into our old town fascinates me wish I could find out something about Barracks square or yard think it was somewhere round Vicar lane ?